It happens all too often: an unsuspecting person pays a visit to a neighborhood pet store. Once inside, they round a corner to find themselves face to face with a beautiful, vividly colored Macaw who greets them with a boisterous "Hello!" Instantly, the person is smitten and minutes later they are driving home with their new parrot. Many people that find themselves in this situation are unaware that macaws can live for close to 100 years. Some have no idea that many birds have special dietary requirements or that they need to be handled and let out daily. Often, situations like these lead to unhappy owners as well as unhappy and unwanted birds. Make sure that this does not happen to your family by reviewing these tips on choosing the right bird for you. What Size Bird is Best for You? As a rule, the bigger the bird, the bigger the commitments involved with keeping it. Large birds can make exceptional companions but are often louder, messier, and more demanding than smaller species. For these reasons, it is generally recommended that novice bird owners start out with a small to medium sized bird. The size of your bird will be important in determining how you will care for your pet, as far as training, housing requirements, and overall interaction. Before you buy a pet, it's important to think realistically about how much bird you can handle. Do you want a bird that will be eager to come out of his cage and socialize, or would you prefer a pet that likes to be seen but not touched? The way your bird relates to you will be an important factor in the quality of the caregiver experience and it also impacts the bird's life as well. Keeping this in mind, it is important to note that different species of birds exhibit various behavior patterns and dispositions. An African Grey will behave quite differently from a Canary, for example. Those interested in a companion bird should make sure to research the species that they are interested in so they can choose the bird whose personality will be most compatible with their own. Some birds require specific diets or other special care. Lories, for example, are beautiful, medium-sized birds admired around the world for their striking colors. They have highly specialized digestive systems, however, which require them to be fed a diet of pollen, nectar, and fruit. This, in turn, causes them to produce liquid droppings making it necessary to clean their cages more frequently than those of other species. While there are countless good reasons to buy a pet bird, issues like this are why it is so important for potential owners to learn as much as they can about their favorite species before bringing one home. Keeping a bird can be expensive, and much of that expense can be related to the type of bird involved. Larger birds sometimes have an initial purchase price of thousands of dollars. These species generally require costly cages and accessories that boost the bill even higher. Even smaller birds, while often initially less expensive, still present their owners with various financial obligations. Some birds can live a very long time, and those that care for them are responsible for feeding, housing, and providing them with veterinary care throughout their lives. All of these factors should be considered when choosing a bird so that you end up with a pet whose upkeep you can afford. Parrots need enrichment and toys as well as training so an investment in time in learning tools such as books and seminars is a factor if you want to raise these birds successfully. Some bird species, particularly the hookbills, require daily exercise, interaction, and time out of their cages. Are you able to spare at least two hours a day to socialize with your bird and supervise his out of cage activities? If not, a Finch, Canary or other more independent species may be best for you. 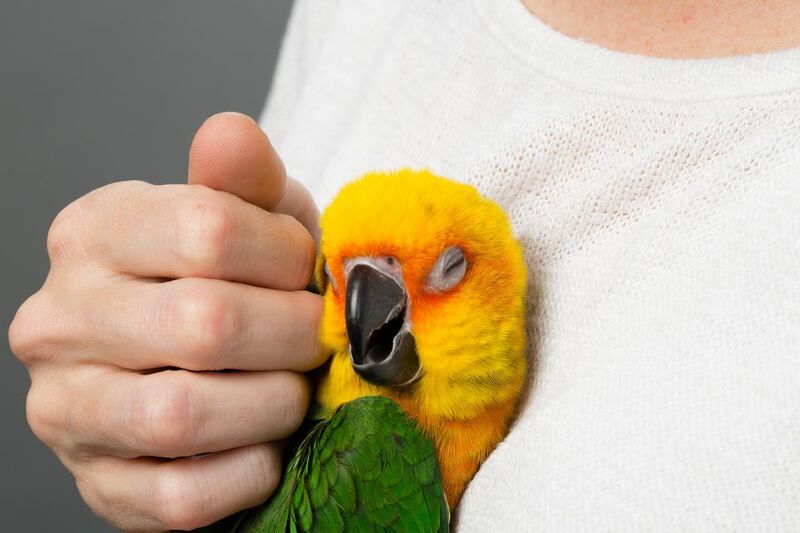 To ensure that your pet stays healthy and happy, you should consider how much time you have available to spend with your bird when deciding which kind you would like to own. You must also consider the time involved in cleaning their enclosure, the floor, and their food and water bowls as well as taking the time to ensure your bird is clean by giving them showers and getting into the sunlight, which is crucial for their health. For those who put a little effort into selecting a pet that will be compatible with their lifestyle, bird ownership can be a tremendously enriching experience. A little research and careful thought can go a long way in making sure that your relationship with your pet is destined to be a good one. By resisting the urge to buy a bird on impulse and keeping these important tips in mind, you are sure to make the right decision about which species will be best for your family. Your best bet? Look to adopt a bird so that you have the support of the adoption and education foundation you adopted from to help you with successfully learning to care for these wonderful companions.